I like to use a combination of mild and sharp cheese. Using just sharp cheese will decrease the lovely flavor of the smoked ham. Oh–and the smokier, the better. Some good combinations include Monterey jack with sharp cheddar, Swiss with mozzarella, or a mild white cheddar with Stilton (don’t use more than 1/4 Stilton or you might be overpowered). But since this is a quickie dish, you can simply use what you have on had, even if that’s just a single cheese. Preheat oven to 350 degrees. Cook the pasta in a pot of salted water, according to package directions. Meanwhile, make a roux: In a saucepan over medium heat, melt the butter and then sprinkle in the flour, stirring constantly. 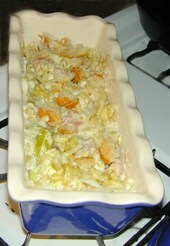 By the time the mixture has an even consistency, it will be as cooked as it needs to be. Reduce heat. 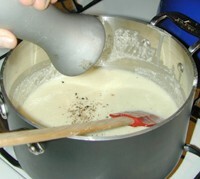 Stir in the milk, whisking constantly to avoid lumps. Simmer the mixture for about 4 minutes, stirring constantly to prevent scalding. Add the cheese, simmer another 3 or 4 minutes, stirring frequently to prevent burning. If you wish, stir in a splash of white wine or vermouth. Salt and pepper to taste. Remove from flame and set aside. Note: The prepared cheese sauce should be relatively thin: think Alfredo sauce, not chili con queso. 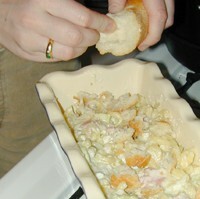 Place the cooked and drained pasta in an oven-safe dish. Add the ham and onions, and mix using a wooden spoon. Pour the cheese sauce over the macaroni mixture, top with a very thin layer of breadcrumbs or torn French bread crust pieces, and bake in a 350 degree oven for about 15 minutes. Let finished dish set up for about 5 minutes before serving. The sauce will be thinner than a typical American mac and cheese. This entry was posted on Tuesday, December 12th, 2006 at 6:44 pm	and is filed under Main Dishes, Master Recipe Index, Side Dishes, Speed Queen (30 min/less), Vegetarian. You can follow any responses to this entry through the RSS 2.0 feed. You can leave a response, or trackback from your own site.